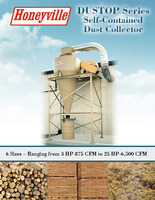 Dustop Series Dust Collectors | Honeyville Metal, Inc. 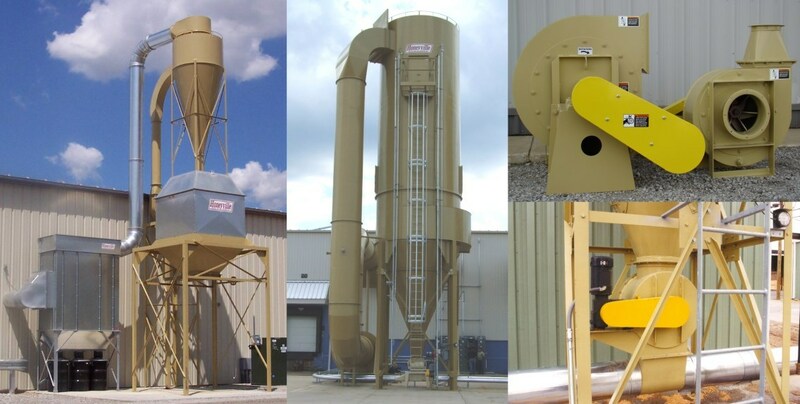 The Dustop Series Dust Collector is a unit that is commonly sized with a Shaker Filter for a compact, economical dust collection system. It can also be used alone with an adjustable vent cap for outside venting of air. With a capacity range of 1,000 CFM to 5,100 CFM, it is ideal for small to medium size woodworking shops. Cone: Long cone design to help minimize dust separation problems. The cyclone is constructed using 12 and 14 Ga. steel with continuous welds and a painted finish for years of maintenance free performance. Fan: Industrial Duty fan with self-cleaning fan design to help performance. Discharge: Dustop can discharge into a dumpster or into a barrel. Compact: Fan is connected directly to cyclone for a compact system. 4620 3 875 6 10' 4-1/4"
5424 5 1,500 8 11' 3-1/4"
6430 10 2,100 10 12' 1/4"
8048 15 3,700 10 14' 1-1/4"
9660 20 5,100 11 17' 2"
12666 25 6,500 11 18' 1-1/2"